Are you looking for a great and simple “antipasto” or a light, vegetarian main course? The Italian recipes are full of this kind of delicious dishes, and what are we about to present today is indeed a wealthy example of Italian cuisine. If you are rushing away, you can use frozen spinach, but if you got time please consider to use fresh spinach! And a little mozzarella into each spinach ball before being fried will help too. Grate the orange peel and squeeze afterwards the orange. Put some ricotta in a bowl and add some milk to make it more creamy. Slowly work half of the juice into the ricotta. Work the orange zest and Tabasco sauce into the mixture, salt the sauce and taste it, and chill the sauce in the fridge. Use fresh spinach, wash it well, cut away any roots, and put it into a pot. Add the salt, and cook over high heat for 5 minutes. Drain the spinach in a sip. Once the spinach are cooled enough, squeeze out most of the moisture. With frozen spinach, thaw it out completely. Mince the marjoram with the spinach. Transfer all to a bowl, add the egg, beaten. Next, put in the cheese and a third of the breadcrumbs. Mix all well until stiff. Add salt, pepper, and nutmeg to taste. Put the remaining breadcrumbs in a bowl. 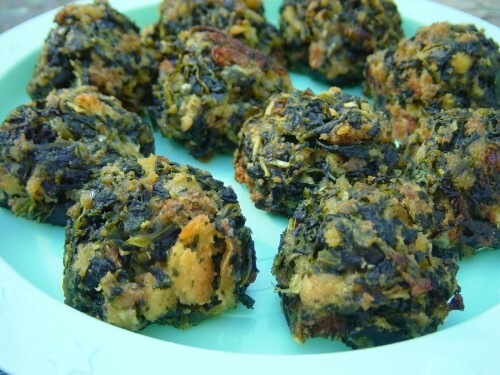 Take the spinach mixture with a tablespoon, scoop it and shape it into small balls. Rolling them between the palms of your hands. Heat the oil and when ready fry the spinach balls, turning them and pressing them down. Spread about 3/4 of the ricotta based orange sauce over the bottom of a serving dish, put the spinach balls over it, and finishing with decorations made of the remaining sauce and some strips of zest. Serve with white wine, like Vernaccia di San Gimignano. This entry was posted on Saturday, December 15th, 2012 at 7:13 pm	and is filed under Italian Recipes and Food. You can follow any responses to this entry through the RSS 2.0 feed. You can leave a response, or trackback from your own site.